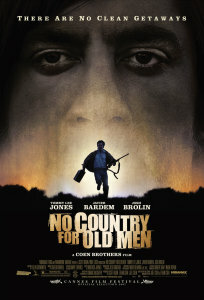 No Country for Old Men (2007) was adapted for the big screen by Ethan and Joel Coen, who also directed, produced and edited the film. Set in West Texas in June 1980, No Country for Old Men follows three central characters – hunter Llewelyn Moss (Josh Brolin) who stumbles upon $2 million from a drug deal gone bad and takes it, killer Anton Chigurh (Javier Bardem) who is determined to find Moss and recover the money, and Sheriff Ed Tom Bell (Tommy Lee Jones) who investigates the trail of bodies Chigurh leaves behind and tries to protect Moss and convince him to turn the money over to the authorities. Based on Cormac McCarthy’s novel published in 2005, the film explores the themes of fate and chance as the main characters’ paths become increasingly entwined as a result of a series of random events that push the story forward. No Country was filmed in the spring and summer of 2006 in Texas and New Mexico. It premiered in May 2007 at the Cannes Film Festival and opened wide in November. It went on to win a number of major awards: the AFI Film of the Year 2007, four Oscars – Best Picture, Best Director, Best Adapted Screenplay, and Best Supporting Actor (Javier Bardem) – as well as the Producers, Writers and Art Directors Guild awards, three BAFTAs, and a long list of critics’ choice awards. When a man stumbles on a bloody crime scene, a pickup truck loaded with heroin, and two million dollars in irresistible cash, his decision to take the money sets off an unstoppable chain reaction of violence. Not even West Texas law can contain it.